Auction creates a transparent platform for buyers to compete for a property. Transparency builds trust, and this leads to a fair and equitable transaction being concluded by all parties. A set auction date allows the buyer time to better plan and organize their finances before purchase, to familiarize themselves with all the auction documents and consult their resources so that they can have confidence in the property and the contract. They know they are dealing with a seller who is ready and willing to make a decision on auction day. Buying at auction avoids the traditional offer / counter offer negotiation process. Everything is out in the open. They can see their competition on the day. Rather than missing out on the property to another buyer or having to guess what they need to offer in order to win it, the open bidding arena of the auction allows each buyer a fair opportunity to buy the property. On auction day they can feel confident of the property’s value as they witness other buyers bidding. If successful, the buyer will have the satisfaction of knowing they have purchased at `true market value’. On the fall of the hammer the successful buyer can know that they now own the property. As a buyer, you may have decided that you would like to make an offer on a property that will be auctioned. You have the option to wait until the auction, or to make an offer before the auction. If you make an offer before the auction it needs to be good enough to motivate a seller to accept your offer, rather than go to auction. This offer will need to be unconditional, just as an auction bid would be. When a buyer makes an offer before an auction all other buyers who have shown interest are informed that an offer has been made, although the offer amount is never disclosed. These buyers are also given an opportunity to make an offer of their own. The seller has to right to accept the best offer, or to decline such offers and wait until auction. If you intend to bid for a property at an auction you will need to make arrangements for your finance well in advance, as an auction bid is unconditional. Your Harcourts Platinum agents will be able to assist you in this regard. You will also need to ensure that you have the required deposit on hand – which is usually 10% of the bid price. This is payable on the day of the auction and invested in Trust, with interest for the benefit of the purchaser. If you intend to bid for the property at auction then you need to register. If you are bidding for a company, you need to provide a resolution from that company authorizing you to bid you to bid on their behalf. If you intend to bid on behalf of someone else, then you need to provide a Special Power of Attorney authorizing you to bid. Your Harcourts Platinum agent can guide you on the requirements. This also applies if you are bidding on behalf of someone by telephone. To register, you must present a certified copy of your ID document, or a copy with your original. The same applies to Company Registration papers where a legal entity is involved. You will also need to provide proof of residential address, such as a utility account not more than 3 months old. If you pre‐register, you will still need to show the agent your proof of identity on auction day. The agent will then give you your bidder’s number. The agent will write your name, address and ID number in the Bidders Record and, if you are bidding for someone else or a company, their name, address and proof of identity details. The agent will then give you your bidder’s number, which must be displayed when you bid. When you sign the Buyer Registration from you will be confirming that you have examined the title deed of the property, and that you are aware of the Auction Conditions of Sale. If you would like to bid but are unable to comply with the Auction Conditions of Sale, you may enquire prior to the auction as to whether any variations to these conditions will be entertained by the seller. If so, then you will be able to conclude a Variation Agreement that will become an addendum to the Auction Deed of Sale should you be the successful bidder. Remember that an Auction bid is an unconditional offer – so it cannot be made subject to finance, or any other conditions. If you are unable to make an unconditional offer, then you will need to discuss this with the Harcourts Platinum listing agent. Should the property not sell at auction you may then have an opportunity to make a conditional offer thereafter. Make sure that you have read and understood all the documentation. If you have any doubts or questions please speak to a Harcourts Platinum agent, or to the Auctioneer, who will assist you. If you arrive after the auction has started and wish to bid, you will need to quickly find the agent and register or present your proof of identity, if you have pre‐registered. As soon as you have a bidder’s number, the auctioneer can accept your bids. Return your bidder’s number to the agent after the auction. This auction is being conducted under certain conditions. The Auctioneer will read out the conditions of sale prior to the bidding process. He will allow a period for questions. If you have any questions that have not yet been answered then please ask them. However, it is advisable that before the auction commences you raise any questions you may have so as to have them answered to your complete satisfaction. If you would like to make a bid at the auction raise your Bidders Number to the Auctioneer and ensure he clearly hears your bid and repeats it to you. If he has misunderstood your bid you need to correct it immediately. 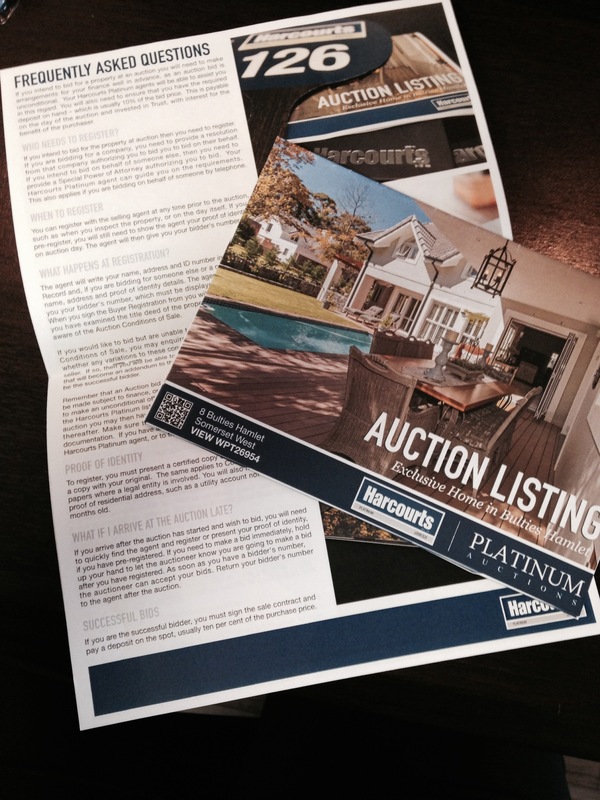 If you need assistance with the bidding process there will be Harcourts Platinum agents on hand to assist you. Remember that at a Harcourts Platinum auction the price you bid is the gross price – in other words, it includes the agents and auctioneers fees. You need only allow for transfer, bond, and registration costs on top of your bid amount. The price you bid will become the Selling Price in the Auction Deed of Sale should you be the successful bidder. 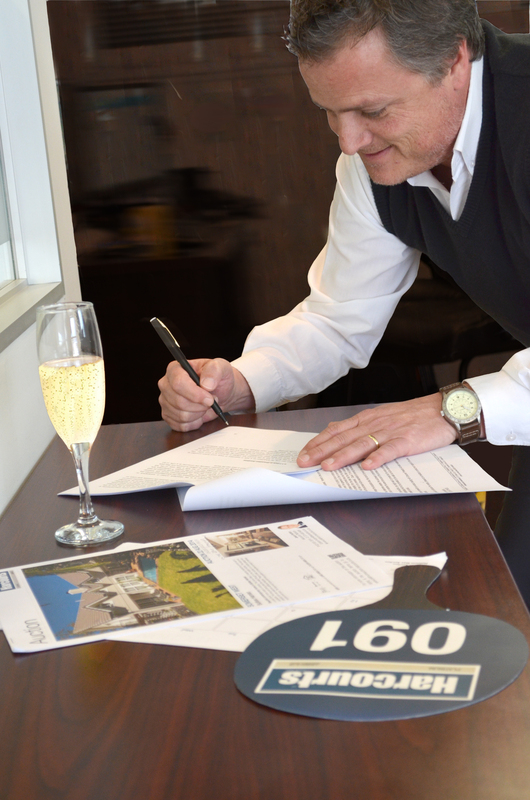 If you are the successful bidder, you must sign the sale contract and pay a deposit on the spot, usually ten per cent of the purchase price. The seller of the property is entitled to have bids made on their behalf by the auctioneer. When the seller’s bid is made the auctioneer must announce it as a seller bid. It is an offence to collude with someone to interfere with free and open competition at the auction. the auctioneer announces before the start of the auction, the bidder registration number of any co‐owner, executor, administrator, or someone bidding on their behalf. Should you have any questions regarding the auction process, bidding, or making offers, then please consult your Harcourts Platinum agent in good time for assistance.